Flipping through the June issue of Vanity Fair on my way out to D.C. last week I noted that when actress Christine Baranski was asked what she considered the lowest depth of misery she said “Being stuck indefinitely in an airport when I’m desperate to get home.” Amen, sista! Take yesterday. After an action-packed few days seeing sights, visiting family and helping my son move into an apartment for the summer, we showed up at Dulles ready to replenish supplies and nap our way back to the Bay Area. Dulles TSA had something else in mind. The security lines were short, but they moved at glacial speeds. When I finally walked through the scanner, my underwire bra set off alarms and things got frisky. While a very serious TSA attendant pulled on rubber gloves and explained just where she was going to inappropriately touch me, I saw the officer at the conveyor belt elbow-deep in my purse. “We’re gonna have to run this through again, ma’am,” he said as his colleague briskly went about her business. What the ?? Lotion, I figured. Maybe my Burberry lip gloss. 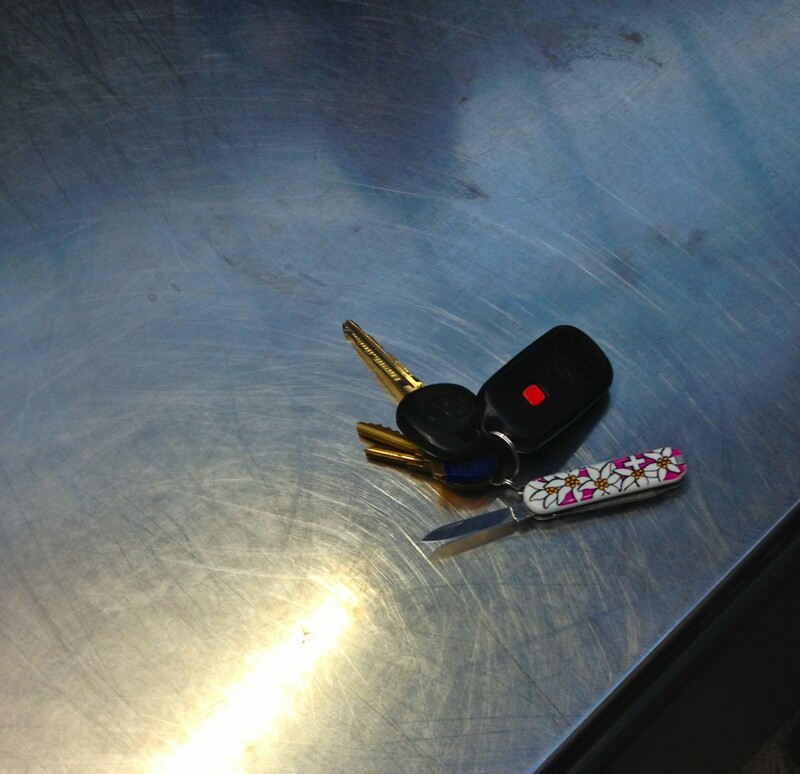 But no, the culprit was a small eidelweiss-covered Swiss Army knife attached to my car keys. And I repeat, what the ??? The little knife hadn’t been a problem flying out. I’d carried it in my purse because I’d read just last week that small pocket knives were allowed again. After losing several when they were first banned, I’d stopped bringing them along when I travel. But at home I carry one all the time because the little scissors implement is so handy. Several moments of heated discussion ensued. My husband valiantly tried to break off the knife blade (technically, the real offender) against the stainless steel counter but to no avail. Eventually, we abandoned the knife fight in order to catch our now boarding flight. Breathless, and frankly close to tears, I settled into my seat and waited for take-off. And waited some more. An hour later we were still on the tarmac and I was getting hungry. The security snafus had precluded buying snacks before we boarded and the flight crew couldn’t sell food until we were air bound. I surveyed my options. 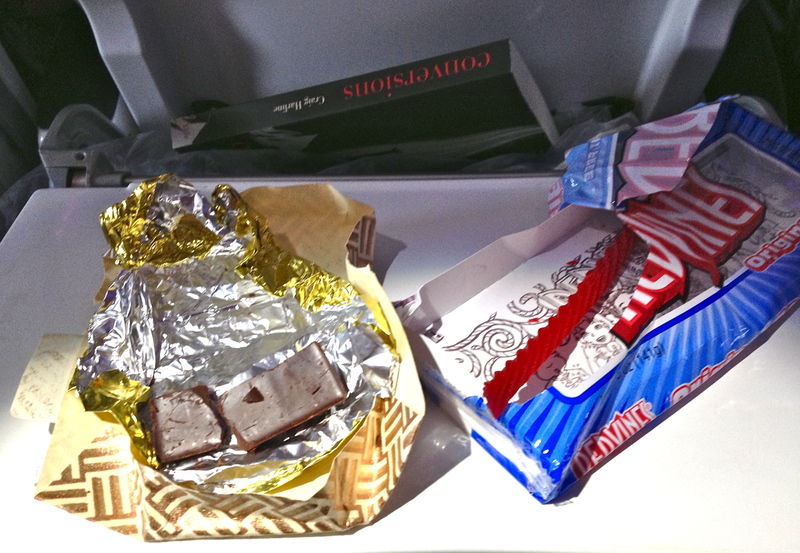 An 1/8 of a bar of dark chocolate left over from my carefully prepared departure picnic and a few Red Vines from a movie with my sister were all I had with me. Despair. Too hungry, frustrated and tired to concentrate on my book, I decided to watch a bad movie with good performers—Billy Crystal and Bette Midler in Parental Guidance. The story was crap cliched, but Crystal and Midler are old pros and their banter—along with a decent vegetarian Thai wrap once the plane was in the air—worked wonders. Once the movie was over I finished reading my book (Conversions by Craig Harline —excellent!) and worked on a needlepoint canvas of fallen angels while listening to Tom Jones sing Leonard Cohen’s Tower of Song. It was dicy whether we’d make our L.A. connection but the helpful crew called ahead and we raced over to the gate just in time. A catnap later we had landed at SFO and were filing a claim for lost luggage (of course). Around midnight/3 a.m.-my-body-clock-time we pulled out of the parking garage and headed across the Bay Bridge for home. My bag showed up here at noon today. Hauling it up the stairs was just another confirmation that travel is hard. It’s easier at the beginning when you’re abuzz with adrenalin and anticipation. But by the end of even the best trips you’re tired and a little peevish and the thought of spending 6+ hours eating carbs you’d never eat at home while trying not to bump elbows with a stranger as you watch endless episodes of the interchangeable Catfighting Housewives just seems like too much. Especially after your favorite key chain pocket knife has just been confiscated. But deep breaths, the right movies, a decent vegetable wrap and some nice attendants—thank you Virgin America for the last two—go a long way towards making the unbearable bearable. Next up—the good stuff that makes travel worth all the trouble. This entry was posted in Spirit, Sustenance and tagged books, food, movies, travel. Bookmark the permalink. Post a comment or leave a trackback: Trackback URL. Oh, I have so been there! 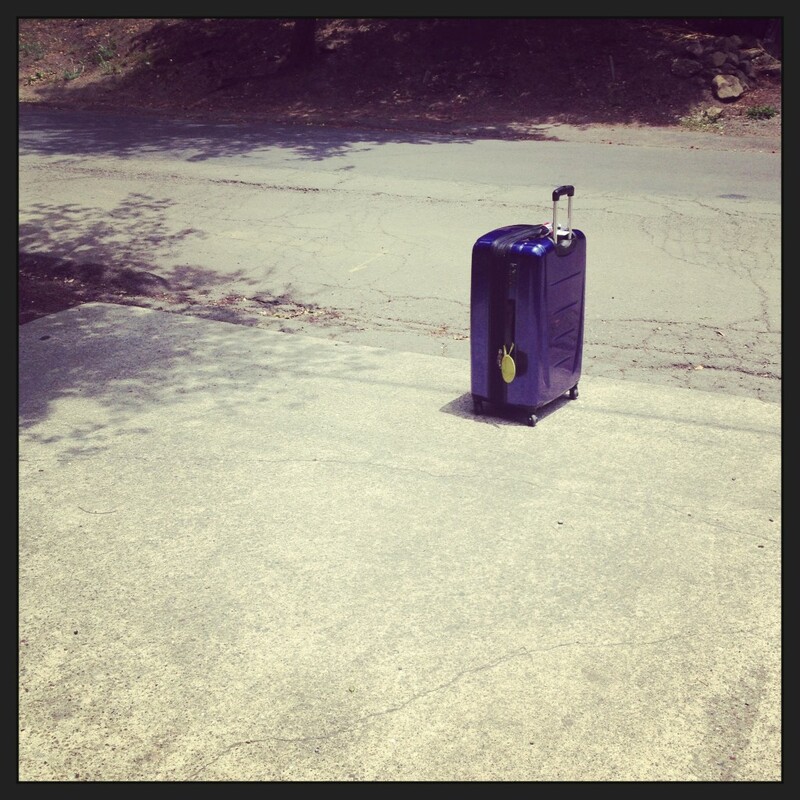 I love the lonely shot of your suitcase. I have had my share of airport adventures that make for good stories later, but they don’t feel like fun at the time. My goal is to have “uneventful” travel – everything on time, just as expected . . . but it seems to seldom happen. Sometimes I stop and think, though, that we are so impatient and frenzied that we don’t marvel at our ability to go across our continent in just a few hours. I try to keep that in mind when I invariably am so tired on the days I travel! So true, Lynette. I think about my pioneer ancestors taking months to cross the country instead of hours and I’m very grateful for the relative ease of modern travel. But I’m still a bit wistful about the even easier days of travel pre-9ll.